This purpose built stage is fully soundproof and equipped with house lighting, power outlets, compressed air reticulation. The stage has an air handling system for fresh air and extraction, a grid of catwalks for set and lighting rigs, plus a grid level dimmer room and three purpose-built rails for green, white and solid screens. Powerboard output capacity ex mains supply of 1000KVA, plus facility to connect 1000KVA generator to subboards as required. A Stage was Stone Street’s first purpose built studio and is 12,600sq ft in size and has been partially soundproofed to achieve a reverb time of approx 1.2 seconds. The stage has been equipped with an air extraction system, compressed air reticulation, an aircooling system and a grid of catwalks for set and lighting rigs. 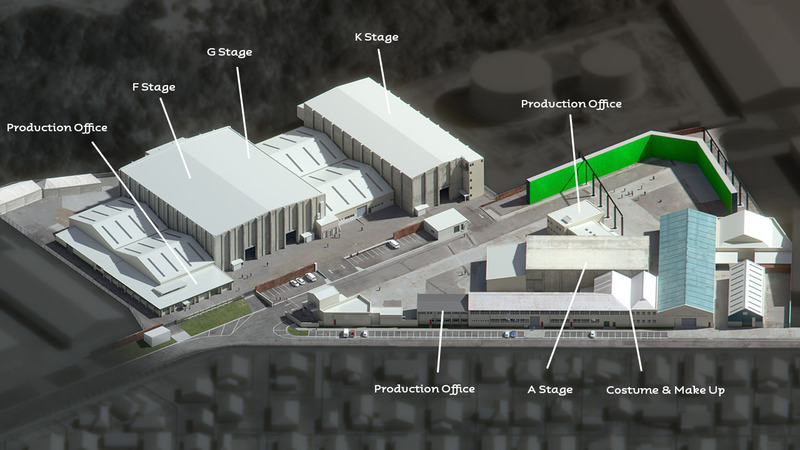 The attached covered truckbay (nearly 4000sq ft) has been used by previous productions for either truck access or as a crew catering area. Powerboard output capacity of 280 kilowatts, additional mains power capacity can be sourced from Studio B. These purpose-built stages are fully soundproof and are equipped with house lighting, power outlets, compressed air reticulation. The stages have an air handling system for fresh air and extraction, a grid of catwalks for set and lighting rigs, plus a grid level dimmer room and three purpose-built rails for green, white and solid screens.